Fabricants only appear during and after the An Attack on Mournhold quest. 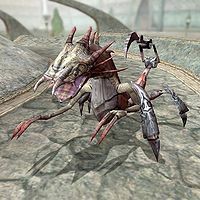 They are mechanical creatures engineered by Sotha Sil, and shouldn't be confused with the Dwemer-made Centurions. 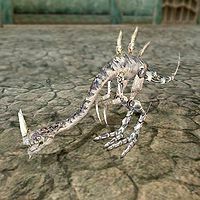 Description: A horrid creature resembling an undersized dragon with six legs and a tail stinger; it seems to be more strong than fast and attacks with claws, fangs, and tail. Found: Plaza Brindisi Dorom, Bamz-Amschend, The Clockwork City. Resistant against: Shock and Paralysis. * For some reason, Hulking Fabricants all have both a Resist Shock 75% effect, as well as a Weakness to Shock 25%. Theoretically, this should be equivalent to a Resist Shock 50%, but it has yet to be determined if there is really any difference. Description: An artificial creature with synthetic legs and tail; it acts fast and agile and attacks with the large fang on its head. Resistant against: Poison, Paralysis and Magicka. This page was last modified on 27 August 2017, at 01:38.